Jennifer Reed, owner extraordinaire of the sugar monkey, is brilliant at what she does. Two plus years ago, I read an article about Jennifer leaving Café Boulud, where she had been the Executive Pastry Chef, to open her own baking business and thought “I have to remember this.” Good thing I did. My first introduction to Jennifer’s talent was at a local Green Market. Her husband was manning the stand and I bought a French Macaroon. I walked away, ate it and then went back to buy many more. Since that day, I am always in awe of what Jennifer creates. Nathaniel’s 18th birthday seemed like a good reason to try a cake from the sugar monkey. I had been searching Palm Beach County for an incredible cake, and had yet to find the perfect one. Nathaniel does not love a “cakey cake.” He and I are similar in our love of many tastes and textures within the final product. It is not just the cakes that I love. 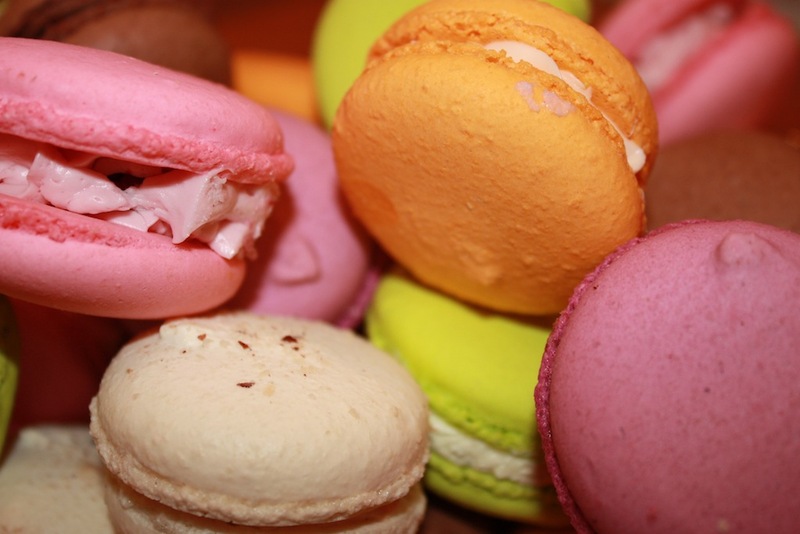 The French Macaroons, as mentioned above, are out of this world. They are as gorgeous to look at, as they are delicious to eat and come in a variety of flavors. I usually buy three to five flavors at the same time because I love the contrasting colors on the serving plate. To give you some idea of my challenge, I must decide between blackberry, raspberry (we love the ones with a raspberry in the middle of the filling,) orange, lemon, pistachio, chocolate, coconut, coffee and hazelnut. You bet it’s difficult. My husband, Stephen, has turned eating macaroons into his “poppable” treat, much to the horror of the rest of us who think we will have more to eat if we save them for the next day only to find the macaroons have disappeared during the night. This year on his birthday, Jennifer made Stephen a giant French Macaroon birthday cake. Stephen was thrilled and the cake was, once again, beyond delicious. For Thanksgiving, I ordered 40 French Macaroons and 40 Butter Cookies in the shape of turkeys. Joshua went with me to pick them up. We left the shop, loaded with three boxes of cookies, knowing our weekend was going to be fantastic. We got into the car and the butter aroma permeated the air. We both had a pavlovian response as we grabbed for a turkey. Then there was silence. We sat in the car for five minutes savoring the taste of perfect Butter Cookies. Before we had left the shop, Joshua and I chatted with Jennifer for a bit. Jennifer mentioned that she was taking a Chocolate Obsession to her Thanksgiving dinner. Joshua and I stopped her midsentence inquiring what exactly a Chocolate Obsession is and why had we not heard of it before. I am sure you would agree that there really wasn’t an alternative for us; we HAD to order a Chocolate Obsession for Friday night. Good choice on our part, but Jennifer did not get the description right. Jennifer told us that Chocolate Obsession is a cross between chocolate pudding and chocolate ganache. She forgot to mention ‘in addition to the extra oomph of OMG.’ Just what I needed, another dessert to be obsessed over, which this one has quickly become. Along the way, I have had the chance to get to know Jennifer. She is warm, witty, knowledgeable, calm (even when faced with an order load that would cause most of us to freeze from anxiety), and is one of the most talented pastry chefs I have ever seen. Jennifer’s love of what she does comes through with each order that leaves her shop. The sugar monkey is not a storefront bakery. Jennifer bakes to order. So plan ahead and get your orders in. Great news for those who do not live in the West Palm Beach area…Jennifer ships her decadent treats, so no one needs to feel left out. Not sure what occasion you should buy a cake/cookie/cupcake/brownie/Monkey Mallow…for? Don’t worry about it, as any day that ends in a ‘y’ is the perfect excuse to treat yourself to the best dessert experience you will find! Update to post – May 22, 2013: I wrote this post in November, 2011. Jennifer continues to be one of the most talented pastry chefs I have ever known. In October 2012 I started working at the sugar monkey on a part time basis. In case you are wondering if this has changed my feelings about the sugar monkey, the answer is, absolutely not. I love working there and continue to buy all of my special occasion cakes from Jennifer, not to mention her Parisian Macarons that I just can’t get enough of! Next to my wife Betsy (I believe in full disclosure), Jennifer makes the best things that I’m not supposed to eat. She is creative without sacrificing quality. You are a wise and diplomatic husband indeed! Personally I like the orange and rasberry macaroons the best because they have the actual fruit in it. P.S. dad very smart move. Thanks Shoshana! I love your feedback and always enjoy watching you beat your brothers to the orange and rasberry macaroons!